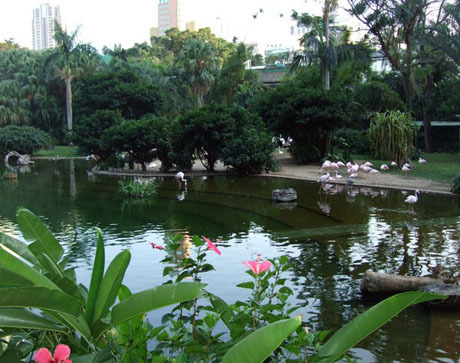 Located in one of Hong Kong’s busiest districts Tsim Sha Tsui, Kowloon Park which covers an area of 13.47 hectares was opened in 1970 and underwent a major redevelopment in 1989. 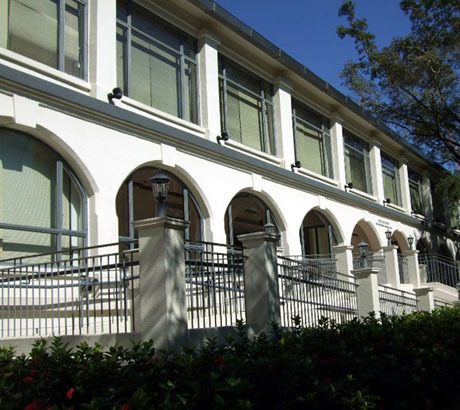 The site was once home to the British Army’s Whitfield Barracks part of which has been restored and houses the Hong Kong Heritage Discovery Centre (see MUSEUMS - KOWLOON for more information about Discovery Centre). 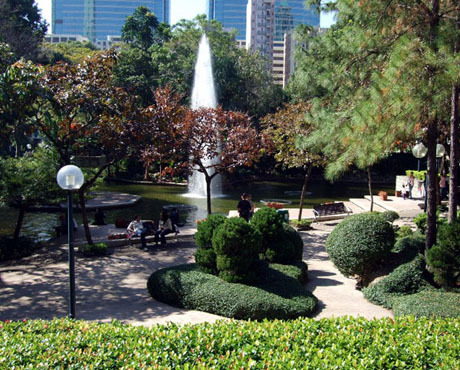 The park runs to parallel to Nathan Road and there are several entrances from Nathan Road, Haiphong Road, Austin Road and Canton Road and there is also a pedestrian footbridge link from China Ferry Terminal at China Hong Kong City. 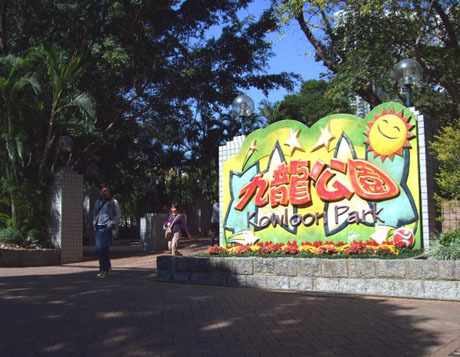 A central avenue runs through the park from Haiphong Road to Austin Road and the northern end of the park is the location for Kowloon Park Sports Centre with multi-purpose arena, dance room, fitness room and squash courts and also Kowloon Park Swimming Pool which has both indoor and outdoor pools. There is also a piazza towards the northern end of the central avenue which is often the location for outdoor exhibitions and concerts. The park has a small aviary with around 40 species of 140 birds including macaws and parrots, Bird Lake with over 200 birds including swans, flamingos, ducks and pochards, Chinese Garden with lotus ponds and rock cascades, maze garden, sculpture walk, a 200-metre loggia providing shelter and seating in wet weather and landscaped roof gardens above Park Lane Shopper’s Boulevard. Every Sunday afternoon between 2-30pm and 4-30pm the Sculpture Walk becomes “Kung Fu Corner” where there are free demonstrations of martial arts and lion and dragon dancing. Also on Sundays and public holidays an arts fair "Arts Corner" operates from 10am until 6pm at the park's South Pavilion Plaza with about 30 stalls selling handicrafts including accessories, paper clay goods, decorations, floral artworks, cloth artworks and soap as well as photography services. The Arts Corner is suspended during major events. 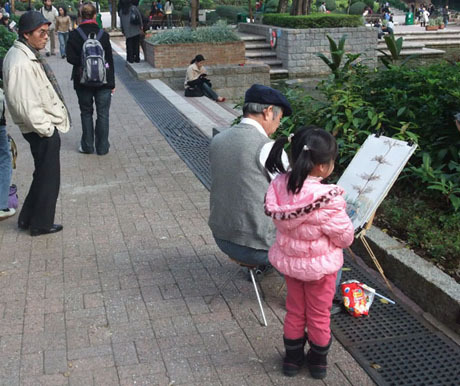 In September 2012 the "Hong Kong Comic Avenue of Stars" opened near the Park Lane Shopper's Boulevard entrance of the park. The attraction displays 24 sets of vividly painted figurines of local comic characters and 10 bronze handprints of local comic artists. There is also a Gallery of Comic History and Development and a Gallery of Comic Education to introduce visitors to Hong Kong comics history, the production process, tools, workshops and manuscripts. 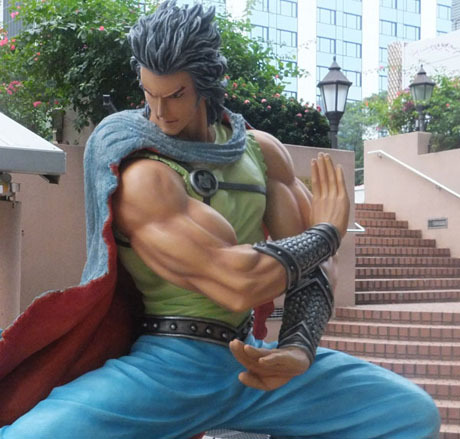 Since the Avenue's opening, the comic characters have been given a "3D-makeover" in July 2013 by local action figure designers as part of the "Comics x Figures Hong Kong Ani-Com Figure Show". ADMISSION - Free admission to park. Charges apply for swimming pool and sports centre. OPENING HOURS – Park open 5am to midnight daily. Swimming pool open 6-30am to 12 noon, 1pm to 5pm and 6pm to 10pm daily. Sports Centre open 7am to 11pm daily. Bird Lake open 6-30am to 6-45pm. Aviary open 6-30am to 6-45pm March to October, 6-30am to 5-45pm November to February. Hong Kong Heritage Discovery Centre open 10am to 6pm Monday to Wednesday, Friday and Saturday, 10am to 7pm Sundays and public holidays. Closed Thursdays. GETTING THERE – Tsim Sha Tsui MTR Station exit A1 (next to Kowloon Mosque on Nathan Road) at southern end of park. Jordan MTR Station exit D then cross Nathan Road and walk (about 3 minutes) short distance along Austin Road for northern end of park next to Tsim Sha Tsui Police Station. Several entrances also on Nathan Road, Haiphong Road, Kowloon Park Road, Canton Road, Austin Road. Also elevated pedestrian walkway from Promenade Level of China Hong Kong City/Royal Pacific Hotel on Canton Road. 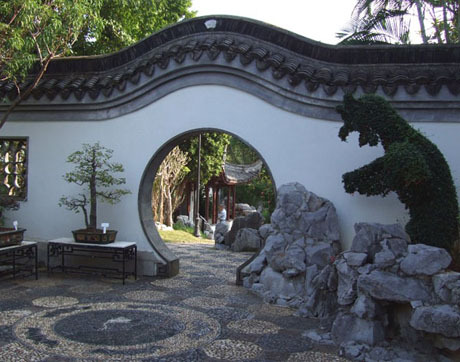 One of Hong Kong’s most interesting and attractive parks Kowloon Walled City Park occupies a historic site and covers an area of 31,000 square metres. The site was used by imperial officials in the 15th century and was first fortified in 1668 when a signal station was established there. In about 1810, a small fort was built at the head of the beach which then adjoined the site. Following the British occupation of Hong Kong Island in 1841 a walled garrison-city was constructed. Massive stone walls with six watchtowers and four gates enclosed the area which measured about 6.5 acres. The interior was dominated by the offices of the Commodore of the Dapeng Brigade, and the Kowloon Assistant Military Inspectorate, commonly known as 'Yamen'. Other military buildings included soldiers' quarters, gunpowder and ordnance magazines. In addition some civilian houses could also be found in the city which was to eventually house over 500 troops. In 1898, the New Territories were leased to the British for a term of 99 years but the Chinese authorities insisted that jurisdiction should continue to be exercised by Chinese magistrates stationed within the city and it was excluded from the lease. Initially Qing officials remained in the city but in 1899 British troops were sent to take over the City and the Qing officials and soldiers were expelled. A lack of civil order from 1899 laid the seeds for the eventual deterioration of the area into a semi-lawless enclave and festering squatter slum. Both uniformed and plain clothes policemen were required to sign a book before entering the city but criminal cases were prosecuted outside. During the Japanese occupation of 1941-45 the wall was torn down and the stone used to extend the nearby Kai Tak airfield. After the war illegal high-rise tenements lacking proper foundations were built and covered virtually the whole site. The Walled City with its dank alleyways became a notorious triad nest of drug divans, criminal hide-outs, vice dens and even cheap, unlicensed dentists. In 1993 the land was handed back to the Hong Kong Government and the site was demolished in 1994. Despite decades of neglect and misuse of the site, a rewarding number of relics were unearthed, many of which were incorporated in the design or preserved as exhibits. The main discoveries were two carved granite plaques from the original South Gate, which had been the main entrance, one bearing the characters for "South Gate" and the other "Kowloon Walled City". Other remnants included the foundation of the former wall, the foundations of the South and East Gates, and a flag-stone path next to the drainage ditch running along the foot of the inner wall. Other relics included three old cannons, stone lintels and couplets, and column bases. 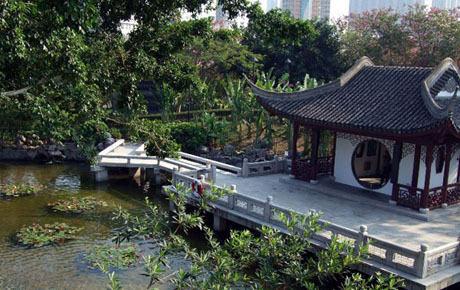 The design of the park was inspired by the Jiangnan garden style of the early Qing Dynasty. 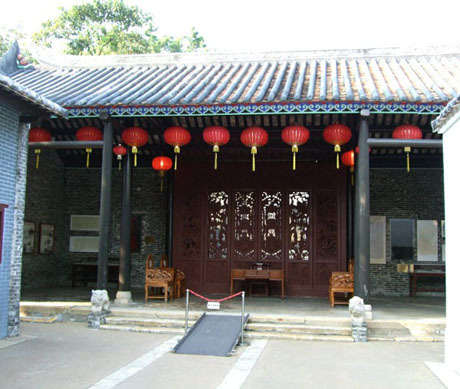 THE YAMEN – a three-hall structure and courtyard complex in the centre of park restored to its Qing Dynasty look and allowing visitors a glimpse of how the walled garrison once looked. It houses a photo exhibition and many relics found in the Walled City. THE OLD SOUTH GATE – the foundations of the original South Gate and two stone plaques discovered in during excavation in 1994. EIGHT FLORAL WALKS – eight paved walks with different floral patterns on either side. THE GARDEN OF FOUR SEASONS – located immediately next to the Yamen is an exhibition space for periodic displays of bonsai. THE GARDEN OF CHINESE ZODIAC – sculptures of the twelve Chinese zodiac signs. THE CHESS GARDEN – four giant Chinese chess-boards built with pebble stones and linked to a Ming-style Twin Pavilion. THE MOUNTAIN VIEW PAVILION – Chinese pavilion with magnificent views of Lion Rock on the nearby mountains of Kowloon. GUIBI AND FUI SING PAVILION – a rock sculpture carved from Anhui Taihu Stone with veins resembling ancient jade and a pavilion named after the star of the Big Dipper which represents the God of Examination. Adjoining the southern and western boundaries of the park is Carpenter Road Park with gardens, pavilions and sitting-out areas. GETTING THERE – Nearest MTR Station is Lok Fu from where it is about 20 minutes walk from exit B via Junction Road south to park North-West Gate on Tung Tau Tsuen Road near its junction with Junction Road or take Green Minibus 39M from Lok Fu MTR Station which passes park entrances on Tung Tau Tsuen Road. From Star Ferry Bus Terminus at Tsim Sha Tsui bus number 1 stops outside the park on Tung Tau Tsuen Road. Other routes serving the park are 111K,10, 85C and 113 which stop on Tung Tau Tsuen Road. Bus routes 11D,11K,75X,85,85A,85B,85C and 891 pass the Junction Road entrance to the park. Bus routes 1A,2A,3B,5,5C,5D,6D,9,11,11B,11D,13D,14,15,16,17,21,24,26,27,28,40,42,61X,93K,95,98C,101,106,107,111,116,203E,296C,297,796X and E23 all stop on Prince Edward Road East near Sa Po Road about 5 minutes walk from the park’s South-East Gate. The stop to disembark from the bus is displayed in the bus as “Regal Oriental Hotel”. Since opening in November 2006 the beautifully landscaped classical Tang Dynasty Nan Lian Garden has become a major attraction. 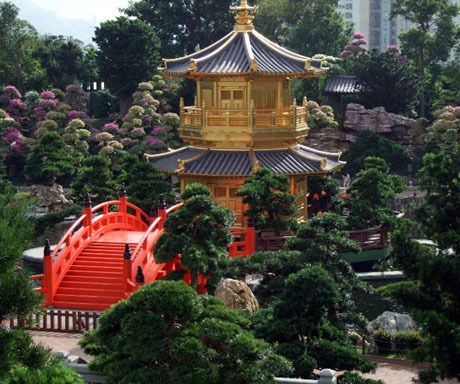 The design and construction of the 3.5 hectare garden was jointly funded by the adjacent Chi Lin Nunnery and the Hong Kong Government in order to promote traditional Chinese culture. 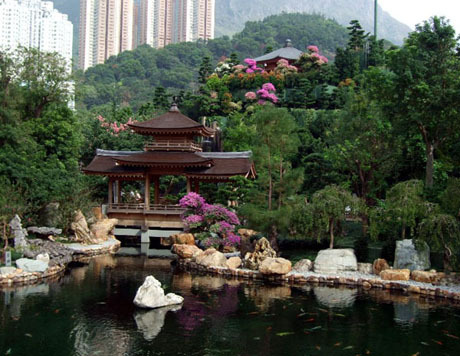 Under an agreement with the government Chi Lin Nunnery is responsible for management and maintenance of the garden for five years for a nominal fee of HK$1. The gardens project an air of serene tranquillity in complete contrast to the surrounding urban hustle and bustle. The design is based on the famous Jiangshouju Garden in Shanxi Province and visitors follow a one-way circular path through the garden allowing them to absorb the splendour of the Tang Dynasty culture. Water features include the Lotus Pond, Blue Pond, Pine Brook, Moon Wash and Silver Strand Waterfall. Large rocks from Guangxi Province and northern Guangdong Province are placed at various locations and hillocks decorated with rocks have been created. Thousands of trees including Buddhist Pine, Cypress, Black Pine, Orange Jasmine, Chinese Hackberry, India Laurel Fig and Elm have been planted and timber structures in Tang architectural style have been built including the gold-plated Pavilion of Absolute Perfection, terraces, verandahs, halls, bridges and black lintel gate at the garden entrance. These features incorporate major landscape gardening styles including jie jing (borrowed scene), tou jing (penetrating scene), yan jing (concealing scene), ge jing (separating scene) and kuo jing (magnifying scene). At the start of the circular path is the Chinese Timber Architecture Gallery with scale models of China’s heritage in timber structures and near the end of the path is the indoor Rockery and Penjing (Bonsai) Garden. There is a vegetarian restaurant Long Men Lou in the north-eastern corner of the garden serving both a la carte and set meals, dim sum and tea sets and there is also a souvenir and snack shop selling vegetarian snacks as well as arts and crafts souvenirs. 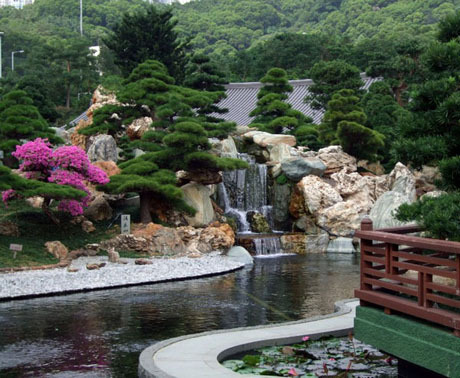 The garden is linked by footbridge to the splendid Chi Lin Nunnery with its Tang architecture, Buddha statues, lotus ponds and bonsai trees. The timber buildings here were built without the use of a single nail and a system of interlocking sections of wood was used in the construction. 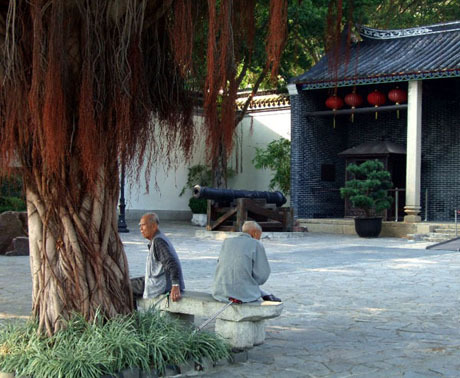 Visitors should not miss the opportunity to visit the nunnery at the same time as the Nan Lian Garden. GETTING THERE – Diamond Hill MTR Station exit C2 (about three minutes walk to garden entrance). Bus routes 11,74X,75X,82X,82P,84M,85C,85M,91,91M,92,286M to Diamond Hill Public Transport Interchange (under Diamond Hill MTR Station). Bus routes 3B,10,11C,74X,91,92 stop near garden entrance on Fung Tak Road.